A while ago Marlow posted this recipe for Creamy Spinach & Avocado Pasta over at Gluten Hates Me and I immediately pinned it to my Dinner Ideas board and have been meaning to make it for dinner ever since. I finally had the chance tonight with all of the ingredients on hand. 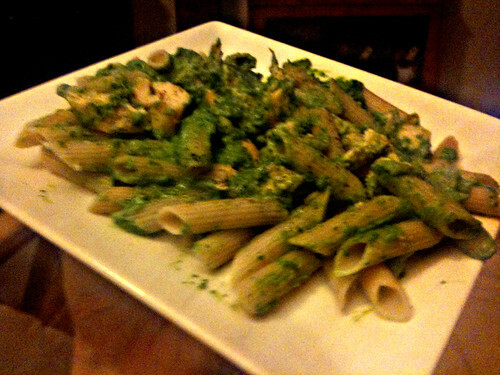 I also kicked it up by adding chicken which I had marinated in dairy free caesar salad dressing dressing all day. I can't believe I waited this long to try this dish with two of my favorite foods, spinach and avocado. Thankfully I made a ton so there are plenty of leftovers!! I used some free samples of Jovial pasta that I had received a while ago and it was also delicious. It cooked up in 9 minutes and was the perfect texture and flavor. Sorry my photos lately are terrible, I have been using nothing but my old iPhone and it's just garbage. I'll have to move my big camera downstairs so I have it on hand! Before dinner I got in a quick 5K. Ok well not really, it took me forever, my legs felt like lead, and I walked a good chunk of it, but at least I did it! 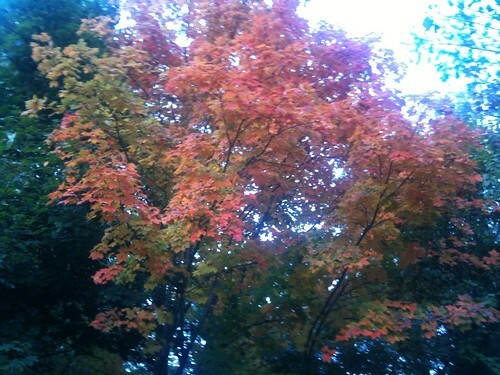 It was nice to look at the fall foliage, I love New England!